The intensity (I or i) of a rainfall event is a storm characteristic that measures the rainfall rate. In America this is in inches per hour ( ). I think the primary reason to determine the intensity is for use in the rational method of determining peak storm flow. The two main methods I have found to get the intensity are from Intensity-Duration-Frequency (IDF) Curves and from empirical formulas (Steel Equation). IDF Curves are curves that have been put together for a specific region using multiple years (decades) of recorded storm data. Here is an example. To get intensity, you need to know the storm frequency as well as the storm duration. If the storm frequency is not one of the common ones (5, 10, 15, 20, 50 etc) you may have to interpolate on the graph and give your best estimate. The duration also may need to be interpolated. With the above pictured IDF Curve (which is for some place in ReviewCivilPE land), a 10 year storm that lasts for d minutes would correspond to an intensity, i. Easy! The steel equation is an empirical equation for for estimating intensity and requires knowing the time of concentration (another process). You also need to determine values of the coefficients c and b (I can't seem to find names for these at the moment). Both the CERM and AIO provide a map of the United States divided up into geographic regions for use with Steel's formula, and an accompanying table of c and b values. With your time of concentration and c and b values, the Steel formula can be solved and your intensity obtained for use in the ration method. Ah the golden question, what are the indicators of going with one method or the other? 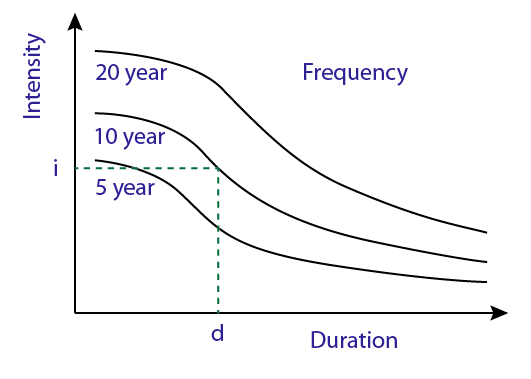 If you are given an IDF curve, and the frequency and duration I think this is a no-brainer, get it from the IDF curve! If you are given a city or region, but no IDF curve, then you should probably shoot for the Steel Formula, they had better given you enough info to also calculate the time of concentration.